It isn’t often that I walk into a wedding and find something new but Steve Bean was something new for me when I first worked with him at a 2005 wedding. 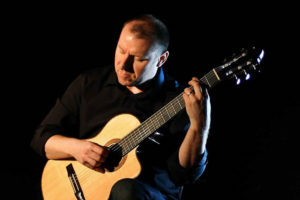 Steve describes himself as a freelance classical guitarist but don’t be surprised to hear some Paul Weller, David Gray or even Led Zep’s “Stairway To Heaven” in his repertoire ! His excellent guitar work provided background music for the service and during the reception meal and it certainly made a refreshing change from the norm. I’ve had the pleasure to work with Steve many times since 2005 – he’s a real easy guy to get along with and, if you’re looking for a little individuality on your big day then I’d put him at the very top of your list without a moment’s hesitation ! Peterborough Weddings was established in 2004 to provide non-commercial links to wedding venues and wedding service providers that I have actually seen in action on a wedding day .... and that's some 400+ weddings as at 2017 ! The information and opinions provided are completely subjective but they are honest and without any commercial bias. "Absolutely fantastic service from first contact down to the final wedding album. Beautiful pictures captured when our guests and ourselves didn’t even realise they were being taken – very highly recommended !"